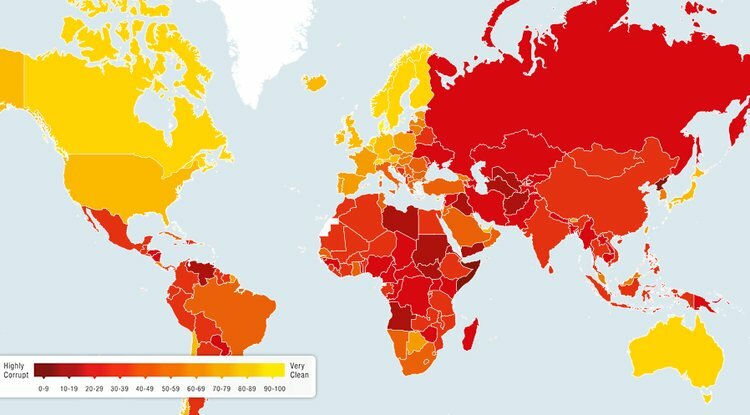 The 2018 Corruption Perceptions Index (CPI) revealed that Egypt has advanced to the 105th rank among 180 countries, up from the 117th rank in 2017 with a score of 35 points compared to 32 points in the 2017 report, showing a slight decrease in corruption domestically. The CPI ranks 180 countries by their perceived “levels of public sector corruption” using a scale of 0 to 100 points, where 0 is given to the countries which witness highest corruption and 100 to the countries which witness the highest transparency. The CPI’s report warned of a crisis of democracy after authoritarians and populists took over several countries worldwide. The CPI ranked Somalia, Syria and southern Sudan the most corrupted countries worldwide while Denmark, New Zealand, Finland, Singapore, Sweden and Switzerland ranked as the lowest corrupted countries. According to the CPI’s report, the United Arab Emirates ranked 23rd, compared to 21th rank in the 2017 report with a record of 70 points. Saudi Arabia stood at 58th rank after receiving 49 points. In 2017, more than two-thirds of countries scored below 50, with an average score of 43. The Middle East suffers from violent conflicts and dictatorships, said the report, adding that corruption is still endemic in Arab countries where attacks on the freedom of expression, press, and civil society continue to occur. Nineteen out of 21 Arab countries garnered less than 50 points on the public sector corruption index.